Every once in a while, I open up my computer, go to my Facebook home page, and wonder how it came to be that my entire news feed is filled with cute little bald heads. It's funny. You don't think often enough about how when you become a cancer mom, you are exposed to mostly other cancer parents, making your friend list full of little bald heads - parents showing off their fighters, angels, warriors, survivors. We are so proud of our little ones, and how much they achieve each day. And if they pass, all we want to do is see their face, so we can remember how happy they made us. And when they are finally cancer free, we want to show off how strong they are. Our world revolves around them more than we know. Sure, my friends who have kids without cancer still use pictures of them as profile photos, and are proud to be parents and proud of their kid's achievements. But, there is something about how little faces below bald heads know so much more about life than their fuzzy topped counterparts. I think it's in their eyes. It's a level of happiness and appreciation and pure joy that I find doesn't show up in the eyes of other kids. Somehow they know that they are special; that they are lucky to have that moment. Sometimes I wonder how they can know so much while being so little. But I guess cancer just teaches different lessons. Loved this post. I want you to know that it is because of Saoirse that I am much more aware of childhood cancer and at least half of the blogs I follow now are children dealing with cancer. I am also going to participate in a fundraiser this summer to raise money for childhood cancer research...all because of your daughter. Thank you for making me aware!!! Beautiful post Kezia. I think that all the bald heads let you see all of those things in their eyes because they comprehend the depth of each of those feelings in a way that no one else can and want to convey it to anyone willing to really look. Keep writing your such an inspiration. Praying for you daily!!! This is such a sweet post!!! I agree with Kim's post. Your beautiful daughter opened my eyes and my heart! I used to be one of those that would be quick to turn the channel when the St. Jude's infomercial's came on. Because of Saoirse's story..that has since changed. I am putting together a benefit concert to raise awareness for pediatric cancer (unfortunately the first date fell through). 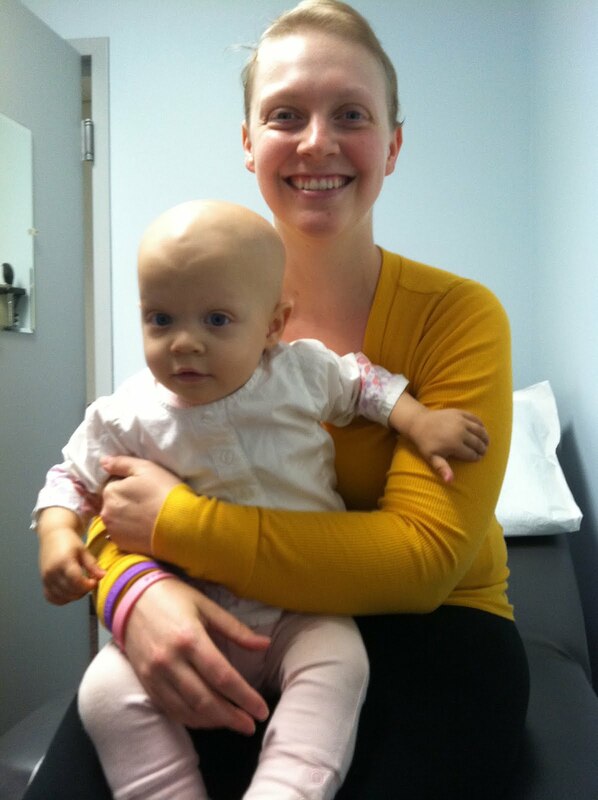 I am a volunteer for Operation: Support a Cancer Cutie...and I am now a bone marrow donor! Saoirse has made a HUGE impact on my life, and I thank you for sharing her with the world! And I quote Kim "thank you for making me aware!" I don’t believe that it is just cancer. Any childhood illness that is all consuming seems to influence a similar outcome. Family obligations change. We spend time with each other, caring and communicating on a much deeper level. Comparing stories looking for answers over a common ground. This creates the associated groups regarding focused issues of a particular condition or disease. We create an environment of exposure to things that may not be possible in an unknown future. Societal issues change. Time is spent together in much smaller gatherings. Large group activity is limited by condition. The focus is changed to family, friends and caregivers, a much more intimate group. Competition, being the best and winning are not the primary focus. Intimacy thrives in this instance. You stop looking for free time, except for time out of care facilities. Time spent together and the experiences created are more focused and therefore remembered. We get to know our children, and they get to know us, much more intimately. They are exposed to a level of caring and nurturing that seldom occurs in other people’s lives today outside of illness. We shall be forever grateful for what she taught us. Unbridled devotion goes both ways. I think I fist told you pre-cancer that Saoirse looked like she was born with an old soul. Her eyes were unbelievably deep, and so many times I saw them filled with the joy you and Mike brought her. I'm so sorry for the loss of your Saoirse. I can't imagine the depth of your family's grief. Thanks to both you and Mike for sharing your thoughts and your knowledge. I am forever grateful. I pull up your blog every few months or so. Please keep this going. It provides so much inspiration, and reminds me to cherish every day that I have with my little girl. It breaks my heart that this horrible cancer robbed you of those precious moments with your beautiful daughter, but your attitude and determination lifts me up. I guess that's Saoirse's gift and purpose in this life. I pray that that continues to comfort you and your family. At the very least you deserve that comfort. Yes, I have joined Facebook groups for children with different kinds of illnesses and see their pictures. They were smiling and happy despite their bald head. I am sure they know they are sick, but refuse to allow it to interfere what they are doing. I only think and pray for them and their families. Saoirse looked adorable in those pictures. Aceita mais uma amiga carequinha Brasileira?? Eu também retirei as duas supra renais como sua bonequinha!! Estou lendo os textos antigos do seu blog, conhecendo um pouquinho mais dessa sua história de superação!! Já sou uma seguidora!! Thanks so much for sharing your Beautiful pictures of Saoirse. My 3 year old granddaughter has completed her chemo. You, as well as, my Daughter are the BEST MOMS EVER! When You're Curious.... Like Curious George!